Today is quite the exciting day for Payton! A fun day at school with friends followed by time with family and a whole lot of celebration as today is his birthday! 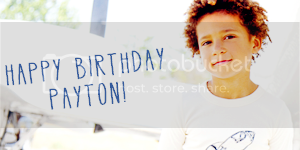 Happy Birthday Payton! I hope you have an awesome day today taking part in all of the birthday traditions your family celebrates with. Enjoy your cake, presents, and I hope that today is everything you hoped it would be for your birthday and more! Happy Birthday!